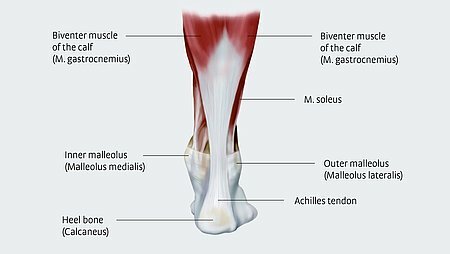 The Achilles tendon (tendo calcaneus or tendo Achillis) is the thickest and strongest tendon in the human body. It is the tendinous extension of the three-headed calf muscle (consisting of soleus and the two-headed gastrocnemius). It inserts on the calcaneus. 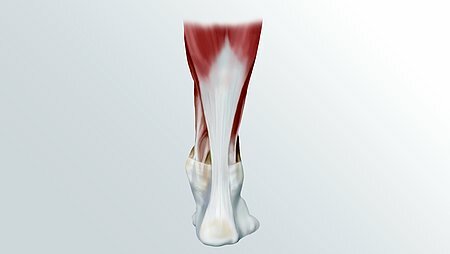 The main function of the Achilles tendon is the transmission of power from the calf muscles to the heel and the foot. This makes it possible to flex the foot (plantar flexion), i.e. : the forefoot is pulled powerfully downwards. This movement is crucial for toe off of the foot when walking and running. The Achilles tendon is also involved in supination (twisting onto the outer edge) of the foot. The tendon at the heel is an infamous weak spot, above all in runners. Many athletes know the Achilles tendon pain syndrome, so-called achillodynia. By the way: Achilles was a hero in ancient Greek mythology. He was considered invulnerable, but he did have one weak spot: his heel. Achilles was hit there by an arrow during the Trojan War, which is why he lost his life. This legend is the reason why the Achilles heel has become synonymous for a vulnerable spot and gave its name to the human Achilles tendon. 1 Klein, C.: Orthopädie für Patienten [Orthopaedics for Patients]. Publisher: Michels-Klein, Remagen 2014.